SAN DIEGO -- Imagine getting the keys to your very own bed and breakfast, and your new business didn't cost you a cent, it just cost you your way with words. Chris and Dennis Aplanalp own the Freedom House Bed & Breakfast in Dover-Foxcroft, Maine. They are former Coronado residents who have poured their heart and soul into their bed and breakfast, and now they want to find its new owner or owners. "It truly is a step back in time into the 50s and 60s," said Dennis. The couple has been running the business themselves since they left their Coronado home back in 2002. "I'm sure we tickled the neighbors as they watched this Californian couple acclimate to Maine winters, but we embraced it, I'm not going to say we conquered it, but we've enjoyed experiencing it," said Chris. Now that experience is coming to an end so that they can spend more time with their grandchildren. They didn't have any when they first moved to Maine, but now they have nine. "Seeing them for a week here or a week there once, maybe twice a year is just not enough," said Dennis. So they decided to give away Freedom House for almost free. They are asking for interested people to write an essay, 200 words or less, explaining why you want to be the next owner. "It's kind of like a child, we want someone to take it over that's going to appreciate the beauty and all of the effort that we have put into it," said Dennis. The couple said no experience in running a B&B is necessary. "I don't think anyone should shy away because they have never done it before, we hadn't done it before," said Dennis. The Aplanalps say the best part of owning a B&B is the people. "The number one thing we're going to miss is the ability to reach out to a lot of different people," said Dennis. The plan for their next adventure is to spend a lot of time with their grandchildren. There's a $150 entry fee and they are accepting essays until September 19. 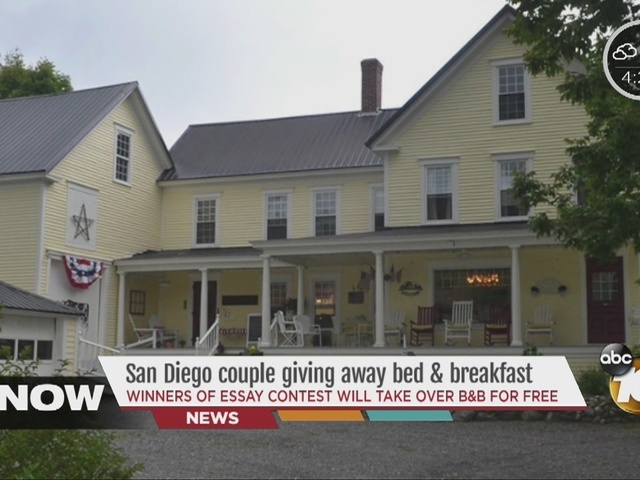 The couple said they will hand over the title free and clear to the winner of the essay contest. They also said they would be willing to train the new owners.